Christians celebrate the funeral rites to offer worship, praise and thanksgiving to God for the gift of a life which has now been returned to God, the author of life. We pray for the person who has died asking for the forgiveness of sin and the gift of everlasting life. The Church calls each member of Christ’s Body to care for the dying, to pray for the dead, to comfort those who mourn. When a member of Christ’s Body dies, the faithful are called to a ministry of consolation to those who have suffered the loss of one whom they love. Christian consolation is rooted in that hope that comes from faith in the saving death and resurrection of the Lord Jesus Christ. Christian hope faces the reality of death and grief but with an attitude of trust. The circumstances surrounding a loved one’s death can vary immensely. The very old person who peacefully and quietly died, the young child tragically killed in an accident. Suicide. A lengthy illness. No matter how death has taken place, the community of faith is called to that ministry of consolation with words of faith and support and acts of kindness. Such assistance then allows members of the family to devote time to planning the funeral rites with the priest and other ministers. Often much has to be done in a relatively short period of time, and sensitivity by all involved will enable the funeral to be planned in a positive and helpful atmosphere. In planning and carrying out the funeral rites, the priest and all other ministers should keep in mind the life of the deceased and the circumstances of death. They should take into consideration the spiritual and psychological needs of the family and friends of the deceased and their sense of loss. Planning of the funeral rites can take place at an appropriate time after death and before the Vigil Service. Ministers are then given the opportunity to explain the meaning and significance of each of the funeral rites, especially the Vigil, the funeral liturgy, and the Rite of Committal. If pastoral and personal considerations allow, the period before death may be an appropriate time to plan the funeral rites with the family and even with the person who is dying. This can help all come to terms with the reality of death and Christian hope. The liturgical celebration involves the whole person and so requires attention to all that affects emotional as well as spiritual well-being. In every celebration for the dead, the Church attaches great importance to the reading of the Word of God and accordingly it is not to be omitted. The readings proclaim to the assembly by the paschal mystery, teach remembrance of the dead, convey the hope of being gathered together again in God’s Kingdom, and encourage the witness of Christian life. The homily will reflect these pastoral elements in the context of the person’s life. Music is integral to the funeral rites. It allows the community to express convictions and feelings that words alone may fail to convey. It has the power to console and uplift the bereaved and to strengthen the unity of the assembly in faith and love. The music at funerals should support, console and uplift the participants and should help to create in them a spirit of hope in Christ’s victory over death and in the Christian’s share in that victory. The time immediately following death is often one of bewilderment and may involve shock or heart-rending grief for the family and close friends. The Church then, in its rites, begins a journey of farewell. The ministry of the Church is one of gently accompanying the mourners. The Vigil for the deceased, which is normally celebrated in the parish Church, is the principle rite celebrated by the Christian community in the time following death and before the funeral liturgy. It may also be celebrated in the home of the deceased, Funeral Home, Marae or in another suitable place. The Vigil is a very appropriate time for those more personal touches, eg tributes/eulogies and favourite songs which the funeral Mass is not able to accommodate. It is also comforting to use the other three brief rites ‘Prayers after Death, Gathering in the Presence of the Body and Transfer of the Body to the Church or Place of Committal’. These rites are signs of the concern of the Christian community. The circumstances for the celebration of these rites may vary from place to place and culture to culture. The rites given are models only for adaptation according to circumstances. The funeral liturgy is the central liturgical celebration of the Christian community for the deceased. When one of its members dies, the Church encourages the celebration of the Mass. When Mass cannot be celebrated, the Funeral Liturgy outside Mass is celebrated. At the funeral liturgy the community gathers with the family and friends to give praise and thanks to God for Christ’s victory over death, to commend the deceased to God’s tender mercy and to seek strength in the proclamation of the paschal mystery. It is the policy of this Archdiocese to ensure there is no more than one eulogy at the funeral Mass, and this is to take place directly after the opening greeting. Tributes/eulogies are encouraged at the Vigil Service. This protects the integrity of the funeral liturgy. The final commendation is the final farewell by the members of the community, an act of respect for one of their members whom they entrust to God. It also acknowledges the reality of separation and affirms that we all share the same destiny. The rite of committal, the conclusion of the funeral rites, is the final act of the community of faith in caring for the body of its deceased member. It may be used at the grave or crematorium. In committing the body to its final resting place, the community expresses the hope that the deceased awaits the glory of the resurrection. In the Archdiocese of Wellington we wish all to experience a Church who carries out its ministry of consolation to the full, irrespective of whether or not the family has much evident connection with the Church community. Indeed, at a time like this, we can give great witness to what it means to be a caring community of faith. This is a ministry of hope and consolation, one that the Church calls us to do with great care and sensitivity. and all the dead whose faith only you can know. Most people are very impressed with Catholic funerals and the way we honour and pray for our dead. Our Christian faith helps us to confront the reality of death as we are reminded that Jesus himself told us that we can overcome death through our faith in him. The priest is here to help you. As the above quotation says the Church (priest and people of the parish) are to gently accompany you as you face the reality of the death of someone you love. The time between death and the funeral can often be very difficult, you have to break the news to relatives and friends, arrange a funeral, see the body prepared for burial, and close the casket. Your friends, the priest, the funeral director, people in the parish are here to help and support you. When you contact your parish to arrange a funeral time, ask what resources are available to you. 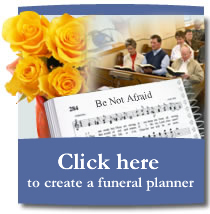 Some parishes will have people to help you plan the funeral and to assist you in your grief. The comfort to be gained from such support is immeasurable. When you are not sure what to do in preparing for a funeral and making practical arrangements, please ask. The story of the death is one you will need to tell. Explaining the circumstances of the death to one person after another will help you to believe the unbelievable. Happier stories need telling too. Family and friends are able to contribute their memories and the sound of laughter surprises you. At the same time something else begins to happen, because there is another story which needs to be told, that is the story of Jesus – his death and rising to new life, his refusal to let death have the last word. As we reflect on the life of the person who has died and on the life and death of Jesus Christ, we begin to see that this person mattered so much to God that God wants this person to live forever. The time of death and mourning is also a time of prayer. It is a wonderful time to thank God for the life of the one who has died, to pray for eternal life for him or her and to ask for strength and comfort for those who mourn. Very often at times of preparing for funerals people say, “It is our relative’s funeral, why can’t we just do what we like?” Sometimes people misunderstand that the liturgy is the Church’s prayer, and while there are several options available, there are also principles to be followed. The Vigil (prayer in the Church, on the Marae, at the family home, or at the Funeral Home on the night before the funeral) is really the first moment of public prayer. There may have already been many opportunities for prayer at home or in a funeral home, but what we know as the Vigil is the time for the community to gather. This prayer can be a time of remembering, of giving thanks, of praying for forgiveness of sins and for strength and peace for the family who mourn. Ideally this time of prayer should take place in the Church, as the church is the place where the Christian community comes together to praise God, where the Christian life begins in baptism and is nourished in the Eucharist, and where the community gathers to commend one of its deceased members to God. The structure of this Liturgy is very simple, and there are options, please ask your priest and other parishioners to help you if you are unsure. A greeting and an opening song (well chosen music can touch people at levels words often cannot reach). Scripture and response, or some other poems or readings (such readings are much more appropriate on this night than at the funeral Mass). A brief homily or reflection. Concluding prayer and a blessing. Or, this is also the time when the Rosary may be prayed. This is the traditional way the Vigil was celebrated and many still prefer to pray the Rosary. People are very free to ask their priest to structure this in whatever way suits them: Rosary, Scripture Readings, Hymns and Prayers of Intercession. This is also an appropriate time for tributes to be given, eulogies to be delivered and memories to be shared. Often people wish to include eulogies or tributes as part of the Requiem Mass on the day of burial, but it is more appropriate to have them the night before. This is also out of sensitivity for the grieving family who may find it difficult to sit through an unnecessarily prolonged Mass or Funeral Service. To most of us, a Catholic funeral service in church is a Mass. Simply put, the Mass is a sharing in the meal provided for us by God through Jesus. It is the meal which bridges the distance between life and death. However the Church makes provision for a Prayer Service (sometimes referred to as a Liturgy of the Word) without Mass in appropriate circumstances, for example when the mourners are not Catholic or have ceased to practice the faith, and therefore would prefer a prayer service in the Church. Even for those who have committed suicide or for children who have not been baptized Mass may be celebrated. Whether Mass is celebrated or not, the church service focuses on the story of Jesus. There is, of course, room for remembering the life which has just ended and naturally this person must be remembered. However, what we celebrate in Church is the hope Christ’s death and resurrection holds for all of us, and especially the fullness of life promised to the one who has died. That belief finds its expression in word (Scripture and prayer), in song and symbol (holy water, which recalls baptism; the Easter candle, sign of Christ’s risen presence; incense to honour the holiness of human flesh and symbolizes prayer ascending to God). When the Scriptures are read, it is the priest’s privilege to reflect on them and share something of the hope they offer, the story of Jesus, and the promise of eternal life. It is his task to connect the life of this person who has died with the message of the Scriptures. Confronted with the mystery of death, human words are totally inadequate. The only word that carries authority is the word of God. It is the role of the Church to let that word speak and allow it to offer hope and comfort. The priest will proclaim the Good News of eternal life which Christ gained for us by his death and resurrection. At no time is the announcement of the Good News more appropriate and more necessary than at the time of death. The rite offers many readings and prayers. Choose those which speak to your needs and memories. From the Church’s wealth of Scripture, hymns and songs, pick those which reflect your taste and speak to your heart, but remember it is always the Church’s prayer and must reflect the Church’s beliefs and practices. There is a further opportunity to weave your own concerns into the Prayers of Intercession. If you are unsure about preparing such prayers, then ask your priests or someone in the parish to help. The final part of the church service is the Final Commendation, which is the prayerful and hope-filled prayer of the community. The priests offer prayers which express both the sadness and parting and the hope of future reunion. It is during this time that the casket is sprinkled with holy water to remind us once more of the promise of everlasting life given at Baptism. It is also incensed to show the respect and reverence due to the human body. Final prayers are offered which return this life to God and then the casket is taken from the church to its final resting place. The funeral rite calls the Rite of Committal “a stark and powerful expression” of final separation in this life. This part of the Funeral Rite in some way challenges the discomfort we sometimes feel with death by urging us to stand beside the grave, face-to-face with death’s finality, but at the same time expressing hope in a life that will never end. The committal is a short and simple service, it includes a brief Scripture reading and a blessing over the grave. The body is then entrusted to its final resting place with a powerful reminder of future resurrection. Prayers of intercession are offered for the dead and for family and friends, and the rite concludes with a blessing. It is appropriate then that there is some gesture of farewell, which will help you to feel that you have done all you can do for your dead and give you a sense of conclusion. Some people wish to place flowers on the casket, others earth, or some may even wish to fill in the grave. It is hoped that the above will help all to see the difference between a New Zealand funeral and a New Zealand Catholic funeral. In a culture where many people leave the Church and return to the day’s business, the Catholic funeral rite encourages us to accompany the body on its final journey to the cemetery and to stand beside the grave with the mourners. It is hoped that people see the three parts of the Order of Christian Funerals as a whole and that they participate in as much as possible of the Vigil Prayers, the Requiem Mass, and the Burial. The New Zealand Catholic Funeral is full of faith and hope. Christians celebrate the funeral rites to offer worship, praise and thanksgiving to God for the gift of life which has now been returned to God, the author of life and the hope of the just. The Mass, the memorial of Christ’s death and resurrection, is the principal celebration of the Christian funeral. The Church through its funeral rites commends the dead to God’s merciful love and pleads for the forgiveness of their sins. At the funeral rites, especially at the celebration of the Eucharistic sacrifice, the Christian community affirms and expresses the union of the Church on earth with the Church in heaven in the one great communion of saints. Though separated from the living, the dead are still at one with the community of believers on earth and benefit from their prayers and intercession. At the Rite of Final Commendation and farewell, the community acknowledges the reality of separation and commends the deceased to God. In this way it recognizes the spiritual bond that still exists between the living and the dead and proclaims its belief that all the faithful will be raised up and reunited in the new heavens and a new earth, where death will be no more. The celebration of the Christian funeral brings hope and consolation to the living. While proclaiming the Gospel of Jesus Christ and witnessing to Christian hope in the resurrection, the funeral rites also recall to all who take part in them God’s mercy and judgment and meet the human need to turn always to God in times of crisis. When a member of Christ’s Body dies, the faithful are called to a ministry of consolation to those who have suffered the loss of one whom they love. Christian consolation is rooted in that hope that comes from faith in the saving death and resurrection of the Lord Jesus Christ. Christian hope faces the reality of death and the anguish of grief but trusts confidently that the power of sin and death has been vanquished by the risen Lord. The Church calls each member of Christ’s Body – priest, deacon, lay-person – to participate in the ministry of consolation: to care for the dying, to pray for the dead, to comfort those who mourn. The community’s principal involvement in the ministry of consolation is expressed in its active participation in the celebration of the funeral rites, particularly the vigil for the deceased, the funeral liturgy, and the rite of committal. For this reason these rites should be scheduled at times that permit as many of the community as possible to be present. The assembly’s participation can be assisted by the preparation of booklets that contain an outline of the rite, the texts and songs belonging to the people, and directions for posture, gesture, and movement. Funerals can begin the process of reconciling differences and supporting those ties that can help the bereaved adjust to the loss brought about by death. Priests, as teachers of faith and ministers of comfort, preside at the funeral rites, especially the Mass; the celebration of the funeral liturgy is especially entrusted to parish priests (pastors). When no priest is available, deacons, as minister of the word, of the altar, and of charity, preside at funeral rites. When no priest or deacon is available for the vigil and related rites or the rite of committal, an authorised lay person presides. In the celebration of the funeral rites laymen and laywomen may serve as readers, musicians, ushers, pall-bearers, and, according to existing norms, as special ministers of the Eucharist. Family members should be encouraged to take an active part in these ministries, but they should not be asked to assume any role that their grief or sense of loss may make too burdensome. Planning of the funeral rites may take place during the visit of the parish priest (pastor) or other minister at some appropriate time after the death and before the vigil service. Ministers should explain to the family the meaning and significance of each of the funeral rites, especially the vigil, the funeral liturgy, and the rite of committal. If pastoral and personal considerations allow, the period before death may be an appropriate time to plan the funeral rites with the family and even with the family member who is dying. When approached with sensitivity and care, it can have the effect of helping the one who is dying and the family face the reality of death with Christian hope. It can also help relieve the family of numerous details after the death and may allow them to benefit more fully from the celebration of the funeral rites. Since liturgical celebration involves the whole person, it requires attentiveness to all that affects the senses. The readings and prayers, psalms and songs should be proclaimed or sung with understanding, conviction, and reverence. Music for the assembly should be truly expressive of the texts and at the same time simply and easily sung. In every celebration for the dead, the Church attaches great importance to the reading of the word of God. The readings proclaim to the assembly the paschal mystery, teach remembrance of the dead, convey the hope of being gathered together again in God’s kingdom, and encourage the witness of Christian life. Above all, the readings tell of God’s designs for a world in which suffering and death will relinquish their hold on all whom God has called his own. A careful selection and use of readings from Scripture for the funeral rites will provide the family and the community with an opportunity to hear God speak to them in their needs, sorrows, fears, and hopes. In the celebration of the liturgy of the word at the funeral liturgy, the biblical readings may not be replaced by non-biblical readings. But during prayer services with the family non-biblical readings may be used in addition to readings from Scripture. The psalms are rich in imagery, feeling, and symbolism. They powerfully express the suffering and pain, the hope and trust of people of every age and culture. Above all the psalms sing of faith in God, of revelation and redemption. They enable the assembly to pray in the words that Jesus himself used during his life on earth. The psalms are designated for use in many places in the funeral rites (for example, as responses to the readings, for the processions, for use at the vigil for the deceased). Since the psalms are songs, whenever possible, they should be sung. A brief homily based on the readings is always given after the gospel reading at the funeral liturgy and may also be given after the readings at the vigil service. From the variety of prayers provided the minister in consultation with the family should carefully select texts that truly capture the unspoken prayers and hopes of the assembly and also respond to the needs of the mourners. Having heard the word of God proclaimed and preached, the assembly responds at the vigil and at the funeral liturgy with prayers of intercession for the deceased and all the dead, for the family and all who mourn, and for all in the assembly. Music is integral to the funeral rites. It allows the community to express convictions and feelings that words alone may fail to convey. It has the power to console and uplift the mourners and to strengthen the unity of the assembly in faith and love. Since music can evoke strong feelings, the music for the celebration of the funeral rites should be chosen with great care. The music at funerals should support, console, and uplift the participants and should help to create in them a spirit of hope in Christ’s victory over death and in the Christian’s share in that victory. Music should be provided for the vigil and funeral liturgy and, whenever possible, for the funeral processions and the rite of committal. An organist or other instrumentalist, a cantor, and, whenever possible, even a choir should assist the assembly’s full participation in singing the songs, responses, and acclamations of these rites. Also the use of appropriate CD’s or taped music. During the funeral liturgy and also during the vigil service, when celebrated in the church, the Easter candle may be placed beforehand near the position the casket will occupy. According to local custom, other candles may also be placed near the casket during the funeral liturgy as a sign of reverence and solemnity. In the rite of final commendation the gesture of sprinkling may also signify farewell. Incense has traditional Biblical significance and is used during the funeral rites as a sign of honour to the body of the deceased. A book of the Gospels or a Bible may be placed on the casket as a sign that Christians live by the word of God and that fidelity to that word leads to eternal life. A cross may be placed on the casket. Only Christian symbols may rest on or be placed near the casket during the funeral liturgy. At the conclusion of the funeral liturgy an antiphon or versicle and response may be sung as the body is taken to the entrance of the church. Psalms, hymns, or liturgical songs may also be sung when the participants gather at the place of committal.